After discussing the recent disputations that have occurred between Armenia and Azerbaijan, Stephen Blank goes on to make recommendations for greater U.S. engagement in the Caucasus. The U.S. has displayed indifference, or at least apathy, toward the situation. This needs to change. Armenia’s threats reflect the facts that NATO disregarded Armenia’s claims and that the OSCE, largely because of distrust between the U.S. and Russia, cannot bring itself to function as intended (i.e., as a mediator). But the threats also reflect the fact that behind most of the headlines, this has been a very good year for Azerbaijan in its international relations, particularly its energy diplomacy. As a result, Azerbaijan has become more strategically important to the West, including the U.S.
Baku has stood its ground with Moscow. While doubling gas exports to Russia, it signed a major deal with BP to develop new gas holdings off its shores, thus not only maintaining its energy independence, but also demonstrating the importance of the planned Nabucco pipeline to Europe. Azerbaijan has also visibly improved its relations with Turkmenistan, to the point where a Turkmen decision to send its gas to Europe through pipes traversing Azerbaijan is now quite conceivable. 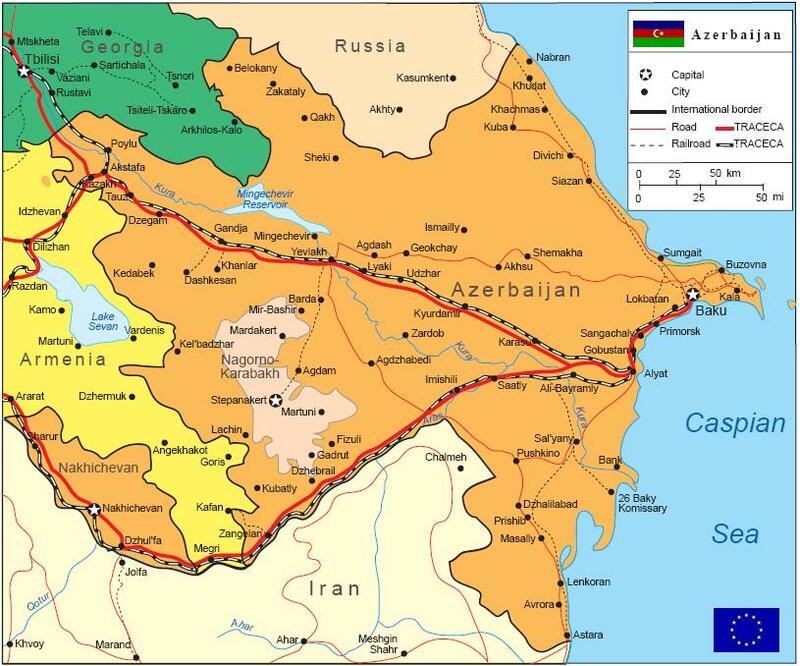 Further, Azerbaijan signed a four-party deal to build an Interconnector that will send Azeri gas through Georgia and the Black Sea en route to Romania and then Hungary. This deal enhances Azerbaijan’s importance to Southeastern Europe as a reliable supplier of oil and gas. Also in 2010, Azerbaijan improved its ties and signed an energy agreement with Turkey. While these agreements cannot hide the fact that no progress was made on Nagorno-Karabakh — over 30 serious incidents occur daily on the “Line of Contact” there — they do show Azerbaijan’s growing importance to Europe and self-confidence in international affairs. Armenia, by contrast, has little to show for its efforts except continuing dependence upon Russia. For example, because of its refusal to negotiate with Azerbaijan, Armenia remains estranged from Turkey — a situation that decreases Armenia’s GDP by 15 percent. Recent reports show that Armenia ran weapons to Iran, something that will hardly endear it to the West. The 2008 Russo-Georgian War showed that even small wars in the Transcaucasus can have repercussions that far transcend the region. Failure to take an active role in resolving the Nagorno-Karabakh issue not only cements Armenia’s dependence upon Moscow and estrangement from Turkey and Europe; it also undermines the success Azerbaijan has had in strengthening Europe’s position vis-à-vis Russia on energy security. Continued neglect of Azerbaijan, and of the Transcaucasus as a whole, can only erode U.S. standing and damage its credibility in the region, confirming Russia’s belief that the reset policy amounts to an acknowledgement of its right to a sphere of influence over the Commonwealth of Independent States. Under the circumstances, the ongoing failure of the U.S. to play an active role here makes no sense at all — and worse, encourages the drift to war. Hidden, or perhaps simply assumed in my prose, was the understanding that the Caucasus region is oil and natural gas rich. Blank recognizes that the Caucasus is strategically important due not only to its oil and gas, but also as a potential way to blunt the force of Russian hegemony (or possible developing Russian hegemony). So there are three good reasons to engage the Caucasus: (1) Oil and gas, (2) as a barrier to Russian influence (see Rapidly Collapsing U.S. Foreign Policy for as discussion of Russian basing rights and logistics in Armenia), and (3) as an already-proven line of logistics to Afghanistan in lieu of Pakistan. Actually, as Stephen Blank points out, in spite of the fear mongers who believe that Georgia will drag us into a war with Russia, there is a fourth good reason to engage the Caucasus region: to prevent war from occurring. I don’t hold out high hopes that the Obama administration will pursue engagement of the Caucasus, as I am not convinced that they care about any of the above justifications that we have offered. However, Russia is not our friend, we still need logistics to Afghanistan, our automobiles and trucks still need to run in order to support our economy, and war between Armenia and Azerbaijan would be a humanitarian disaster. Iran is attempting to move to higher Uranium enrichment, and Ambassador John Bolton is warning us to get ready for a nuclear Iran. The CIA has already warned us. Unless Israel acts unilaterally, the Obama administration will be in the difficult position of trying to explain why so much energy was invested in the prevention of a nuclear Iran, when it was acceptable all along for Iran to possess a nuclear weapon. In other words, it must explain why containment would have worked all along, thus making fools of those who tried to forestall that otherwise acceptable condition. In a stark testimony to the fact that the Middle East has no confidence in our stomach for doing whatever is necessary to contain Persian hegemony, Kuwait and France have signed agreements on nuclear cooperation, and Saudi Arabia has established a new national agency to take the lead role in nuclear activities. These countries do not need commercial nuclear power for purposes of energy infrastructure. Commercial nuclear power is the first step to having the infrastructure, QA, training and protocols to control a weapons program. Even the UAE is planning a nuclear site with four reactors. Iran has made no attempt to hide its lack of fear of U.S. presence in the region. Iran has been at war with us in Iraq since the inception of Operation Iraqi Freedom, and there are dead U.S. servicemen whose lives were sacrificed to the altar of avoiding the necessity of addressing the regional conflict. Just recently an Iranian reconnaissance aircraft buzzed the U.S. aircraft carrier Dwight D. Eisenhower, coming within 1000 yards of the ship. This kind of aggression has become fairly routine. During the 2008 deployment of the 26th MEU, an Iranian helicopter all but landed on the deck of the USS Iwo Jima. The Marines could almost touch it from a standing position on the deck, but no actions were taken. The Navy refused to allow the Marines to fire on the aircraft. Iran has made its presence known in the recent Iraqi elections, and Moqtada al Sadr is trying to emerge as a legitimate political power after having been trained in Iran for the last several years. Things don’t look much better to the North. In spite of recommendations to seriously engage the Caucasus region, we have snubbed our allies in Georgia (in spite of their having sent the Georgian 31st Infantry Battalion to assist us in Afghanistan) and most recently it appears that we are losing Azerbaijan. Azerbaijan’s long-standing alignment with the United States is rapidly unraveling in the wake of Washington’s recent policy initiatives. As perceived from Baku, those US initiatives fly in the face of Azerbaijan’s staunch support over the years to US strategic interests and policies in the South Caucasus-Caspian region. 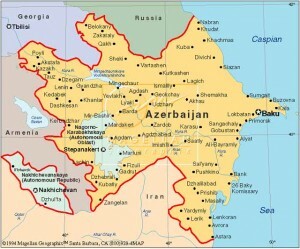 Current US policies, however, are seen to favor Armenia in the Karabakh conflict resolution negotiations, curry favor with Armenian advocacy groups in domestic US politics, split Turkey and Azerbaijan from one another over the Karabakh issue, isolate Azerbaijan in the region, and pressure Baku into silent acquiescence with these policies. 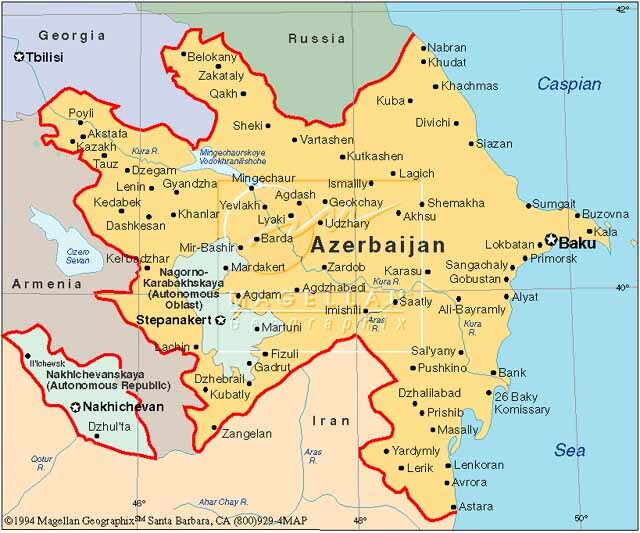 Key actors in the region tend to share Azerbaijan’s perceptions in this regard. During last week’s nuclear safety summit in Washington, Georgian President, Mikheil Saakashvili, and Turkish Prime Minister, Recep Tayyip Erdogan, spoke frankly in this regard. They told US interlocutors at every step that the refusal to invite Azerbaijan’s President, Ilham Aliyev, to the summit was a mistake, counterproductive to US interests in the region, and confirming perceptions that Washington was attempting to isolate Baku. US President, Barack Obama’s, meeting with his Armenian counterpart, Serzh Sargsyan during the Washington summit (while failing to invite the Azerbaijani president) confirmed perceptions that Armenian issues in US domestic politics distort Washington’s policy on the Karabakh conflict and toward Azerbaijan. Ankara had cautioned Washington against such moves ever since Erdogan’s December 2009 visit to the US. At least from that point onward, Turkey has closed ranks with Azerbaijan, instead of distancing from it and opening the Turkish-Armenian border promptly and unconditionally at the Obama administration’s urging. The administration insists on de-linking the border opening from the continuing Armenian military occupation of seven districts beyond Karabakh, deep inside Azerbaijan. The administration had, instead, hoped to link the border opening with the April 24 US anniversary of the 1915-1918 Armenian events in Ottoman Turkey. Washington’s summit miscalculation is the latest in a year-long series of blows to US-Azeri relations. This trend continues amid an apparent US strategic disengagement from the wider region (rationalized as a “strategic pause” to assuage pro-US governments there). In Azerbaijan’s case, Washington seems unable even to fill the long-vacant post of US ambassador in Baku. The vacancy deprives the United States of steady high-level access to Azerbaijan’s leaders (which had never been a problem previously), while making it more difficult for Washington to grasp the crisis in US-Azerbaijan relations and its region-wide implications. It isn’t clear if the U.S. policy regarding Azerbaijan is malicious or merely inept. What is clear is that we are still witnessing the collapse of U.S. foreign policy, a fact both easy and sad to catalog. We have closely followed the implementation of the Taliban strategy (pointed out here at The Captain’s Journal one year ago and one half year before it began in earnest) to shut down lines of logistics via the Khyber region and through the Torkham Crossing. The closing of the Manas Air Base in Kyrgyzstan has occurred due to entirely different reasons than enemy strategy. Or has it? Russia is asserting itself in what it considers to be its near abroad, and has essentially bribed the officials in Kyrgyzstan to close down the Manas Air Base. This makes the U.S. utterly dependent on logistical lines that run through Russia to Central Asia. Of course, this places the U.S. in a precarious position regarding membership of Georgia and Ukraine in NATO, as well as missile programs in Poland and elsewhere. If the U.S. is dependent on Russia for logistics, then it is much more likely that Russia will be able to assert itself in the region with U.S. weakness because of dependence on Russian cooperation for logistics. For this reason The Captain’s Journal had recommended approximately two months ago that the U.S. work harder on a potential logistical lines through the Caucasus region, specifically, from the Mediterranean Sea through the Bosporus Strait in Turkey, and from there into the Black Sea. From the Black Sea the supplies would go through Georgia to neighboring Azerbaijan. From here the supplies would transit across the Caspian Sea to Turkmenistan, and from there South to Afghanistan. If this line of supply came to pass, then this leaves the issue of refueling for air supply and transit through the region unaddressed, since this was the primary mission of the Manas Air Base. Stephen Blank, professor at the US Army War College, has written that of the potential replacements for Manas, none appear to be viable. But unaddressed in Blank’s commentary is the potential to base air support in either Azerbaijan or Turkmenistan. Returning to lines of logistical supply, as we recently reported, there are ongoing talks concerning the Caucasus region regarding the very routes we have discussed. Furthermore, trial runs of supplies are ongoing to test these routes. … the Air Force is working on contingency plans to move the tanker fleet to bases in the Persian Gulf if it loses basing rights to Manas. The Azeri capital, Baku, is emerging as a leading candidate to substitute for Manas, should the Kyrgyz government refuse to reconsider its withdrawal of the basing rights. 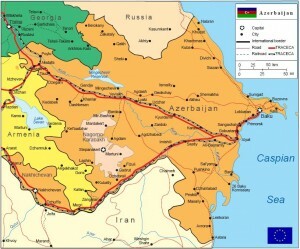 American and Azeri officials said that the focus of the discussions on Monday and Tuesday was a surface route that would move supplies from the Georgian port of Poti on the Black Sea and overland to Baku, where they would cross the Caspian Sea to Aktau, Kazakhstan, and then overland across Uzbekistan into Afghanistan. 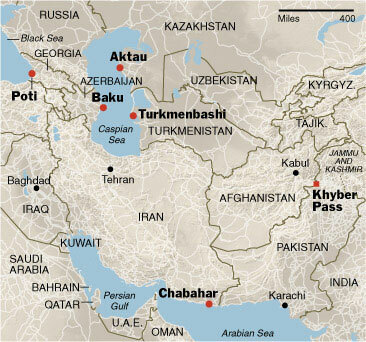 A second potential route would land cargo at the Caspian seaport of Turkmenbashi, in Turkmenistan, for transit into Afghanistan. Talks on supply routes have also been held with officials in Tajikistan, another neighbor to the north of Afghanistan. One American official said the first “trial run” of cargo containers on the new route was conducted within the last two weeks, with shipments of lumber sent from Turkey to Georgia to Azerbaijan, and then onward toward Afghanistan. So this report notes not one, but two potential lines of logistical supply over land, as well as the potential replacement of the Manas Air Base with Baku, Azerbaijan. At this point it might be that the Russians backpedal on disallowing Manas to continue to function (thus the recent equivocation in the news), since U.S. involvement in the Caucasus (i.e., their near abroad) is the last thing they want. But this logistical transit route is viable. First to Azerbaijan. Azerbaijan is more developed than Turkmenistan, and is obviously the center of gravity of both of the potential logistical lines discussed above. Baku would be almost ideal for an air base to support refueling operations for U.S. aircraft supporting Operation Enduring Freedom. 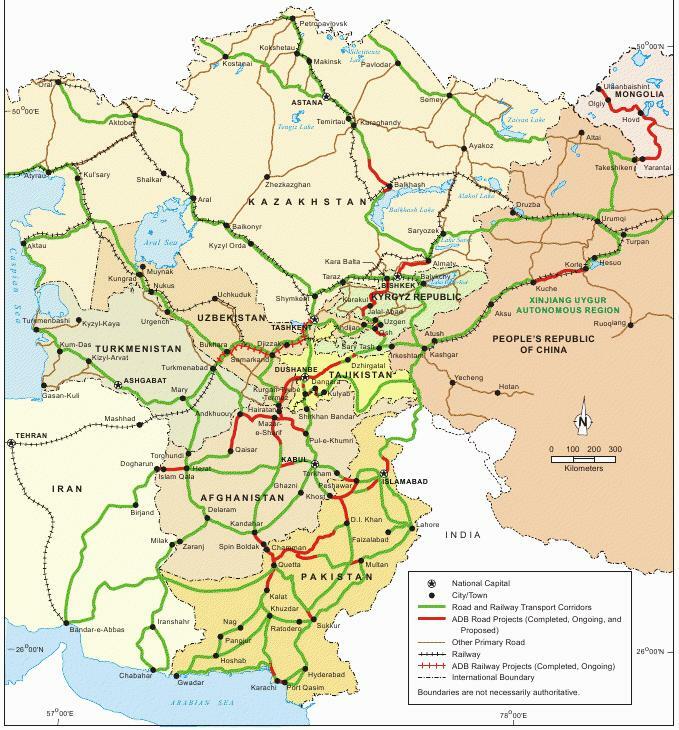 Turkmenistan is far less developed, and the only viable route for supplies would go through Ashgabat from the port city of Turkmenbashi, and then South to Kandahar or East to Kabul. Much ink has been spent spilled over the human rights record of Turkmenistan and Uzbekistan, and both are undoubtedly repressive regimes, although there is evidence that Turkmenistan is slowly and gradually changing for the better. There is also significant corruption in Turkmenistan. But there is also indication that Turkmenistan is opening up to economic cooperation. They have expressed an interest in becoming an associative partner in the ECO (Economic Cooperation Organization), and have recently opened their air space to NATO supply flights to Afghanistan. The U.S. has a history of moral preening when it comes to working with unsavory dictators and political regimes, but this preening must be put aside in favor of functionality and logistics. Georgia, Azerbaijan and Turkmenistan have all expressed an interest in working with the U.S. to enable lines of logistical supply to Afghanistan. This plan is, after all, what provided more than 40% of the supplies to Russian troops during their campaign. Moreover, a stronger presence in the Caucasus region is in the interests of the U.S. in both the near and long term. Stronger ties will serve to ensure continued supplies to U.S. troops in Afghanistan, cement critical relations in this region and Central Asia, and provide a counterbalance to Russia’s increasing hegemony in their near abroad. It is the right time and circumstances to engage the Caucasus. Postscript: The Captain’s Journal thanks Mr. Bob King, Instructor, U.S. Army Command and General Staff College, Department of Joint, Interagency and Multinational Operations, Leavenworth, for the encouragement to write this article. Ever since The Captain’s Journal warned a year ago that logistical lines through Khyber would be targeted as part of the Taliban campaign, we’ve covered and analyzed the progress (or lack thereof) in developing new lines of supply. There have been occasional problems further South in Pakistan, and while a smaller percentage of supplies goes to Kandahar from the port city of Karachi than through Khyber to Kabul, this recent attack may mark the beginning of a new phase of the Taliban campaign to interdict supplies in the South. Gunmen in Pakistan on Tuesday torched a truck carrying supplies for NATO forces in neighbouring Afghanistan, leaving its driver and a helper wounded, police said. Gunmen snatched the truck in Baluchistan province’s Soorab, 200 kilometres (120 miles) south of Quetta, and set it ablaze after wounding the driver and his helper, senior police official Khaild Baqi told AFP. “The injuries to the driver were serious, but his helper’s condition is stable,” Baqi said. Police chased the attackers and traded fire with them, but the search for them was continuing, he added. Baqi said some 150 truckers parked their vehicles to protest against the attack but that the authorities were negotiating to persuade them to continue their journeys. NATO and US-led forces in landlocked Afghanistan are hugely dependent on Pakistan for supplies and equipment, around 80 percent of which is transported through Pakistan. Nobody claimed the responsibility for the attack. Baluchistan has been rocked by a four-year insurgency waged by tribal rebels fighting for political autonomy and a greater share of profits from the region’s natural resources. The province has also been hit by attacks blamed on Taliban militants. On the other hand it may be the local insurgency rather than the Taliban, although Karachi already has elements of the Tehrik-i-Taliban, and Quetta is the home of the senior leadership of the Afghanistan Taliban. Either way, this is not a good sign. In other news, it appears that someone has been reading The Captain’s Journal. US military officials have held talks with government and business representatives from Turkey, Georgia and Azerbaijan on the transport of supplies to Afghanistan, the US embassy in Baku said Tuesday. The two days of talks in Baku, which concluded Tuesday, were aimed to “coordinate transportation issues that will facilitate the shipment of supplies to US, NATO and partner military forces operating in Afghanistan” through the Caucasus region, the embassy said in a statement. The Asia Times recently summarized why we have been opposed to supply routes that go through and/or rely on Russia. Moscow has every reason to encourage NATO to become more and more dependent on the northern corridor … a Russia-Iran understanding over the Afghan transit routes enables Moscow to exploit NATO’s dependence on the northern corridor, which, in turn, compels the alliance to be sensitive about Russia’s security interests and concerns and at the same time paves the way for Russia to play a bigger role in the stabilization of Afghanistan, which of course suits Iran. Nothing good comes from the logistical transit routes through Russia. To be clear, we had recommended approximately two months ago that the U.S. work harder on the Caucasus route, which is as follows. First, supplies (including military supplies) would be shipped through the Mediterranean Sea through the Bosporus Strait in Turkey. And from there into the Black Sea. From the Black Sea the supplies would go through Georgia to neighboring Azerbaijan. From here the supplies would transit across the Caspian Sea to Turkmenistan, and from there South to Afghanistan. A larger regional map gives a better idea of the general flow path. 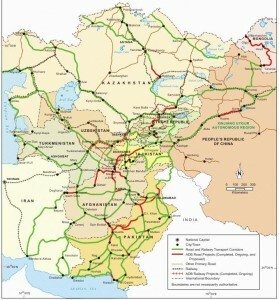 The problems are numerous, including the fact that the supplies would be unloaded in Georgia to transit by rail car or road, unloaded from rail or truck to transit again by sea, and finally loaded aboard rail cars or trucks again (after passage across the Caspian Sea) in Turkmenistan to make passage to Afghanistan. But removal of the logistical lines from Russian control places Iran, the missile shield, and NATO membership for Georgia and the Ukraine back on the table while we still supply our troops in Afghanistan with ordnance and supplies. The U.S. is not “over a barrel,” so to speak. And the DoD and State Department should keep reading The Captain’s Journal.